I had been eagerly awaiting the release of Yak & Co.’s Agent A: A Puzzle in Disguise ever since I saw the first trailer for it. 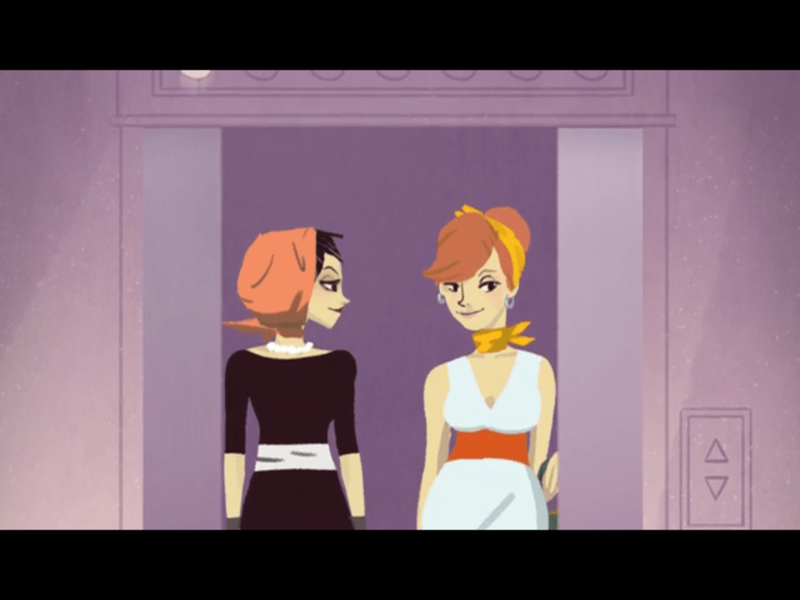 The art style and voice acting were what immediately caught my attention, as well as the lighthearted 60’s spy thriller tone. It actually released sooner than I expected, although only the first part of the game is currently available. 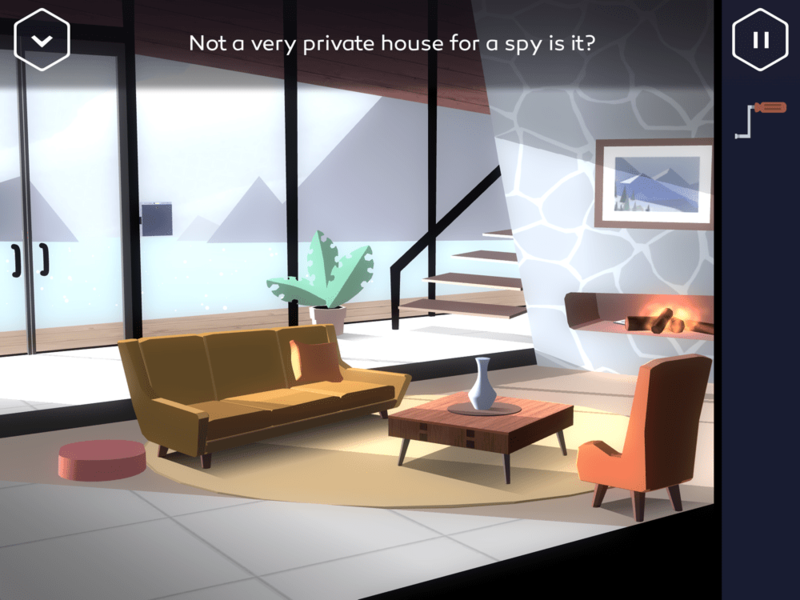 In Agent A, you play a spy (the good kind) who’s hunting down an enemy spy named Ruby La Rouge. She’s been killing off your fellow agents and you need to put a stop to it. Agent A is gender-less, so we are all Agent A. I like how that was done. You don’t really get that from the trailer, but once you start playing, it fits really nicely. It also gives the game opportunities to stroke the player’s ego, saying things like “Agent A is not to be taken lightly.” It’s obviously tongue-in-cheek, but I thought it was a clever way to bring the player into the game and make them feel part of the story. It’s not easy to do so with first-person adventure games, so I appreciate the effort here. As I mentioned, the art in the game is simple, stylish and polished. It feels designed for adults, but enjoyable for all ages. They didn’t go with high realism here. Instead, think of low poly art like that of Monument Valley or Lara Croft GO. It’s a game that makes a strong case for games as art. The music and sound effects also capture the vibe perfectly. The soundtrack is lighthearted but suspenseful. You can hear the fire licking at the logs in the fireplace and there’s a satisfying mechanical noise when you discover some hidden piece of machinery. But in case you think this game is all about appearances, let me talk about the meat of the game, the puzzles. They do start off very simple and straightforward, and I was worried the game as a whole would be too easily completed. Some of the puzzles, especially early on, don’t require too much thought, and one doesn’t even seem like a puzzle at all. But later in the game, there are some really clever bits that even had me stumped for a short while, backtracking to look for something I may have missed. If you found something, you most likely can find its use. But some things are hidden a little better than others, so it pays to touch everything. As long as you keep your eyes open, everything is logical and never feels unfair. The physics — when part of a puzzle — also feel realistic. There are no crazy math problems or riddles, so if that’s what you’re looking for, you might be disappointed. 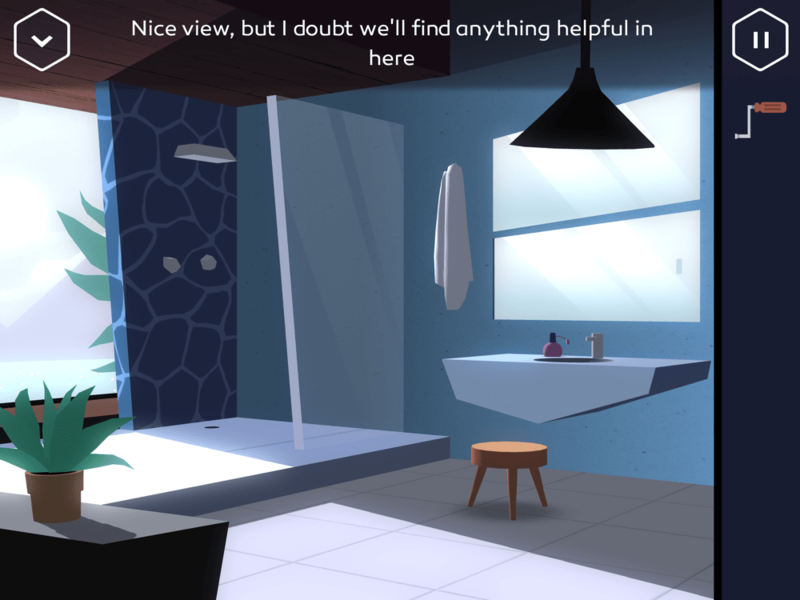 But those just looking for a polished, entertaining puzzle adventure should be pleased with the offering here. Even the filler in this game is just presented so stylishly, that it’s hard to hate on it. But the game definitely shined the most for me when I had an “aha!” moment. There’s some really clever stuff here, but not all puzzles are equal. I wouldn’t even expect that from a room escape game. But I hope that part two features more of the clever stuff and less of the easy filler. I like how a lot of things could be moved or knocked over, even if they don’t have anything to do with a puzzle. It made the environment feel more alive, and I suppose they were also used as red herrings. Like any good spy lair, Ruby’s home is filled with switches, buttons, hidden compartments, as well as deadly traps. So you have to be a good spy yourself and look out for things that don’t seem right. Also, everything you touch gives you feedback, often in the form of a witty line. 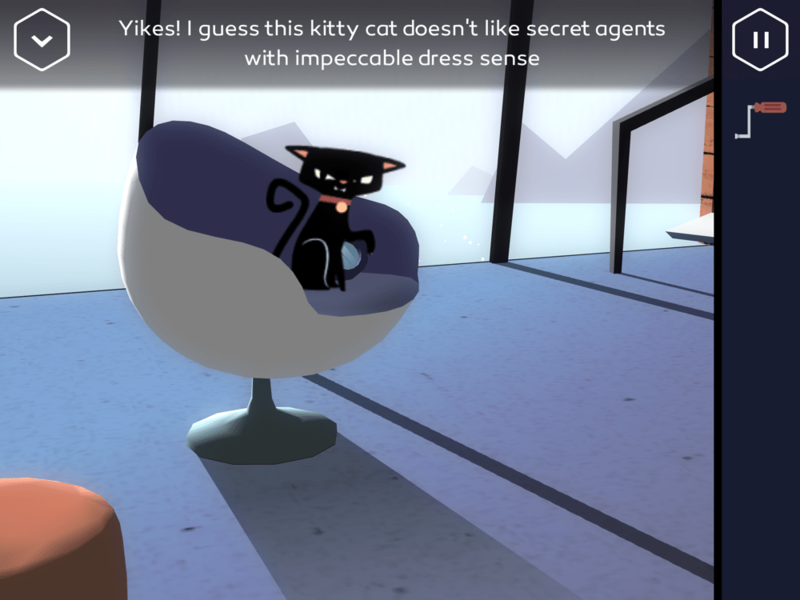 Agent A definitely has a sense of humor, as he/she should in a game like this. Without giving too much away, there’s a point where you need to use water. I’ve played so many room escape games where you have several different sources of water, but the game forces you to use a specific one for that puzzle. It’s usually frustrating and reminds you that you’re playing a linear game with illogical restrictions. But I played through Agent A several times and used a different source of water each time. The developer also confirmed that any source of accessible water will work here. I really love this, as it shows they thought about what the player might try — not just what they want the player to try. Logic prevails! I also like how the game often registers that you’re trying to pick something up or use an item with something else, whether you’re zoomed in or out. A lot of other room escape games will make you zoom close in on an object before you can pick it up. Agent A often cuts out that extra step, but you can still zoom in first if that’s what you want. It really feels like they had the players in mind when they designed everything, or at least listened closely to their beta testers. There are a couple of puzzles that require you to pay close attention to a sequence and then repeat it. These might frustrate some players, and they did take a bit of effort on my part to pass, but I was able to do so after a few tries. I think most people should be fine with it, even the most casual players. But if you really have a hard time with it and want some help, I made a very detailed walkthrough. I did have one small niggle with the game. There are pop-ups that let you know when you’ve completed a mission or what item you found. I thought this was a nice touch, especially being able to pause the game to look over your current and past missions. But these pop-ups were sometimes delayed a bit. It really doesn’t matter much, but I found it a little distracting when I had moved on to another room and was still getting old messages. It doesn’t affect the gameplay, though, and I didn’t find any bugs that prevented me from completing a puzzle. So it’s really me just being nit-picky. Agent A also ends on a cliffhanger and part two isn’t out yet. It was a bit of torture to see “to be continued” at the end, even if I was expecting it. But the developers have stated that, when it’s ready, their current plan is to include part two as a free update. There’s no estimated date of release for part two yet, but I’m eagerly awaiting it. While the first part is a very polished, very enjoyable puzzle adventure game on its own, I think the ending sets up part two for some really great things. It has the potential to make this game a real classic, something to point to as an example of a great adventure game. I would like to see more of the clever puzzles and fewer that feel like filler, but I don’t mind a few easier puzzles as long as the overall game holds my attention. I’m interested in knowing more about Ruby as a character and I want to know just how smart she is. I would love to see her character and story fleshed out more in part two. I think it can make or break this game. Will it end on a very predictable note or will it surprise us? I hope for the latter, but I’m eager to play whatever the developers come up with, as this was a delightful experience. Agent A feels like something really special. Just how special that is, though, will depend on part two. The bottom line is that I really enjoyed my time playing as Agent A hunting down Ruby La Rouge. I think it’s a stylish, polished start that left me with really high hopes and expectations for part two. I hope the developers build something truly special with this world they created, because it shows so much promise. I really love everything that they’ve done here, and I wouldn’t need to think twice about buying any future games built in this universe. I would love a series of Agent A games even after Ruby is (hopefully) brought to justice. If you’re looking for a puzzle adventure game that stands out from the rest, give Agent A a download here and start the hunt for Ruby La Rouge! If you’re already playing the game and need some help, you can try my step-by-step walkthrough here. See my interview with Mark White, the creator of Agent A. 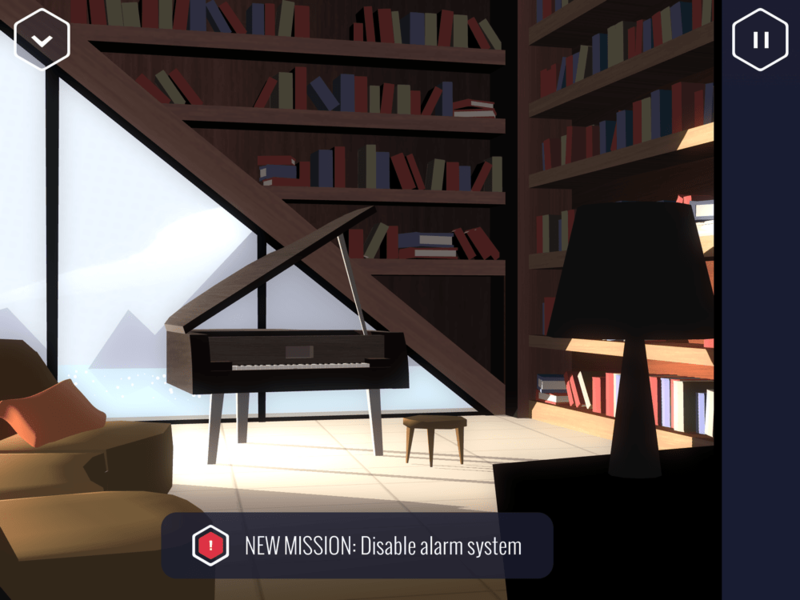 Tags: Agent A, iOS, ipad. ipod, iPhone, puzzle, Yak & Co.
Yeah, crazy crazy week. I can’t keep up! I started Lumino City and can finally continue it soon. I want to write a review for PDTA first. Sanitarium looks great, but I don’t know when I could get to it. Such a big backlog of p&cs! How did you like Please don’t touch anything? Still not sure if I should buy it. The reviews seem to be pretty favourable but I also heard people saying it’s a lot like Papers, Please which I didn’t fancy at all. I didn’t play Papers, Please. I really liked PDTA, but there were a few parts that annoyed me, like an arcade game that I played so many times before I finally beat it. It feels really great when you decipher something and discover a new ending, though. I only really knew about it being a two-parter back when I beta tested a bit. I can try to find out if that was always the intention.